There was an almost a businesslike atmosphere as Friday night's final buzzer heralded the Cavaliers to their second straight NBA Finals. Not to say the team wasn't excited, as hugs were exchanged and daps* given. Locker room footage showed the team dousing each other in water and chocolate milk instead of champagne. Asked by reporters about the lack of post-game bubbly, LeBron James replied matter-of-factly, "We didn't have champagne." No doubt the celebration got more raucous later in the night, but the team's on-camera demeanor was in some part muted and thoughtful, as if finishing 14-2 in the Eastern Conference playoffs shouldn't be cause for Dom Perignon-spritzing joy. These Cavs are way past the "glad-to-be-here" stage, even as two members of the Big Three get ready for their first real taste of championship-round basketball. Fully healthy and coming off a series where the average margin of victory was a ridiculous 28 points, this squad is playing the best it ever has a unit. Obviously, that workmanlike attitude comes from James, who along with teammate James Jones will be tipping off his sixth straight Finals on Thursday. This latest run started two summers ago with a famous 'Coming home' letter, where James and/or his marketing team told a hungry fanbase that nothing is given, everything is earned. 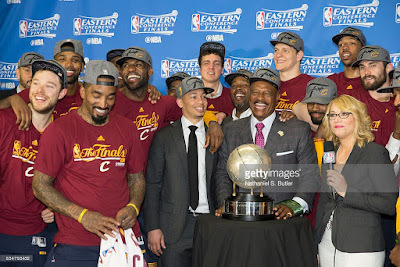 Similar sentiments came from James early this morning after putting the Raptors to bed, as reported by Joe Vardon of Cleveland.com: "We earned the right to be here and represent the Eastern Conference in The Finals," James said. "We're not supposed to be here. We earned our right." These words echo over a long year that witnessed a mid-season firing as well as stretches of lackadaisical hoopage where the entire roster was seemingly encased in "chill mode." The Cavs play this post-season has been far from chilly, yet the team remains focused, calm and prepared for that next, final step. *Author's note: "Dap" is street lingo for the knocking of fists together as a form of greeting or respect.